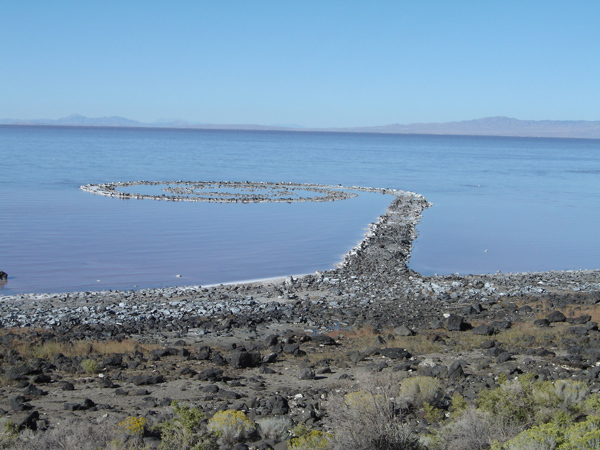 Sorting through old files, I found my photographs of a site visit to Robert Smithson’s ‘Spiral jetty’ (1970) at Rozel Point on the Great Salt Lake, Utah. This was my second visit; documentation of the first was on 35 mm slides which are as-yet unscanned. 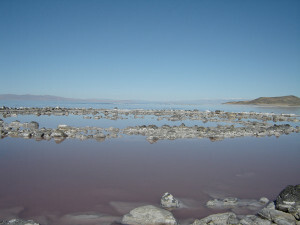 The date of the visit was Saturday 23 September 2006. Photographs were shot on a point-and-shoot digital and have not been modified (other than to re-size for internet use). 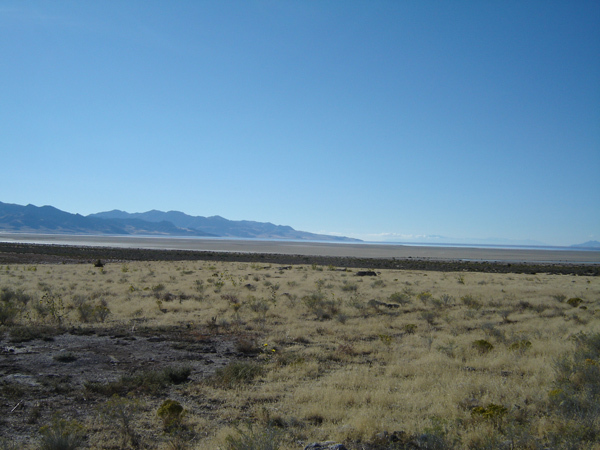 The journey begins on the I 15 interstate highway, driving north from Salt Lake City, bypassing Ogden and heading towards the Bear River migratory bird refuge and Golden Spike monument (the two ‘regulation’ destinations in the north of the Great Salt Lake). The pilgrimage proper begins at the information pavilion at the Golden Spike monument. On my first visit (1997), there were no published directions and only informal advice from friendly rangers more used to serving railroad buffs. 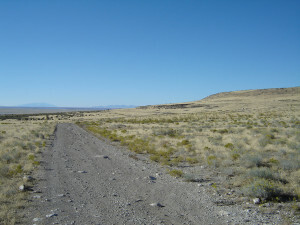 From here, it’s a gravel road heading south to Rozel Point. 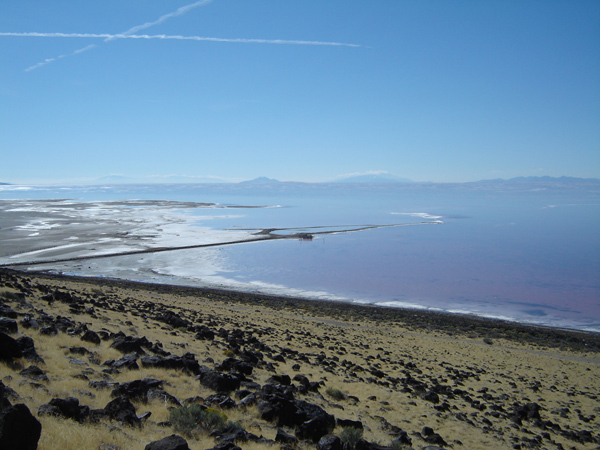 This is the kind of view you see in the opening sequence of Smithson’s film ‘Spiral jetty’; an amateurish attempt at what we’d now call the Discovery Channel aesthetic. It’s not a rough road, by Australian standards, but pot-holed and dusty all the same. While it’s still useful to scope out the route and distances between landmarks along the way, there are signposts now. In any case, you hit the lake eventually. 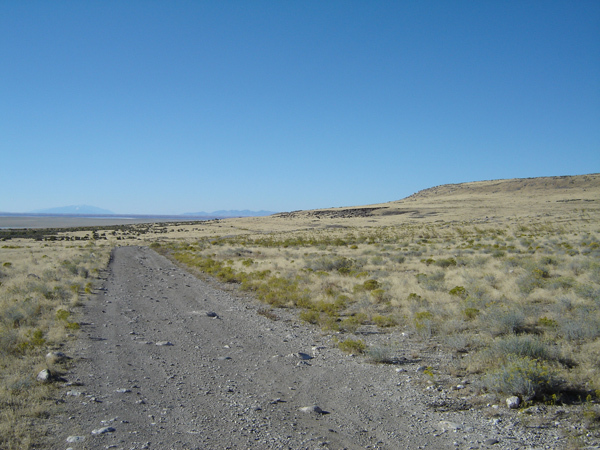 It’s tempting to barrel along through the dry ranching land but worth slowing down to take in something of the topography and environment. I’d left Salt Lake City early, looking to maximise my time on site, and was rewarded with a still, clear day. On the road in, I saw an American badger as well as some deer. 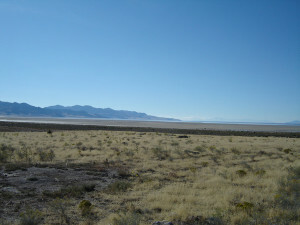 As the road approaches the lake, the Promontory Range comes into view. With few markers for scale, distance becomes deceptive and heat haze (along with fetishistic anticipation) gives rise to false sightings of the lake. 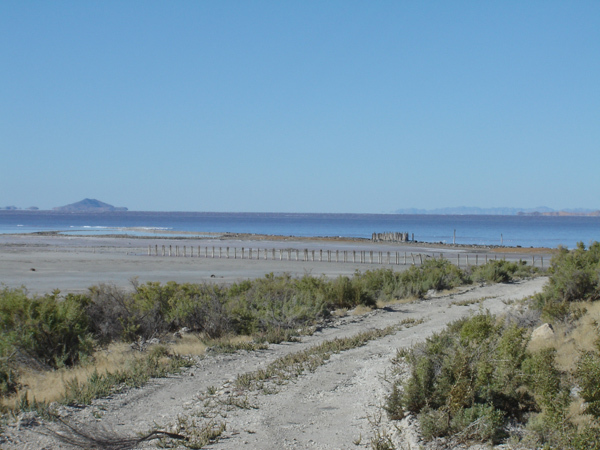 Remnants of the Rozel Point oil field, Great Salt Lake. Photograph: Chris McAuliffe. Once you hit the shoreline, the first thing you’ll see is a ‘false’ jetty. It’s the remnants of an oil exploration jetty, active since 1905 and the site of 18 now-capped wells. When Smithson went to work in the summer of 1970, there was a large amount of industrial detritus around this original jetty; even a wrecked Army-surplus amphibious vehicle. The ruins and waste have now been removed as part on an environmental clean up. On art (as opposed to environmental) conservation grounds, perhaps a misguided decision; Smithson liked the idea of ruins and industrial decrepitude. The site of his impromptu ‘Mica spread’ (1970) may have been destroyed in the process. 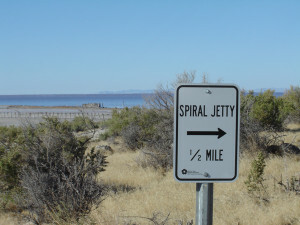 Signage at Rozel Point, Great Salt Lake. Photograph: Chris McAuliffe. 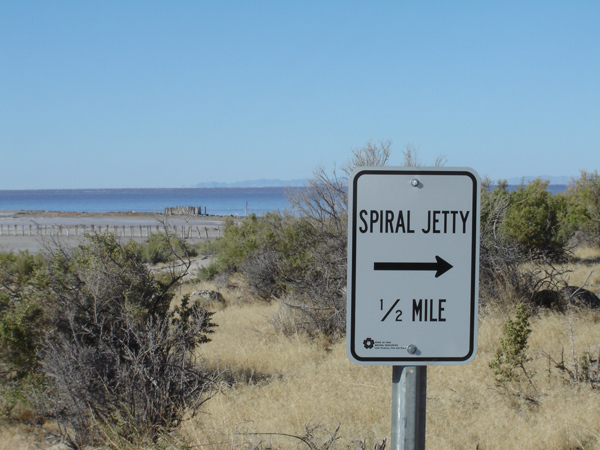 As well as being a site of art pilgrimage, the ‘Spiral jetty’ is listed in some guide books as a quirky roadside attraction. There are signposts now, too. 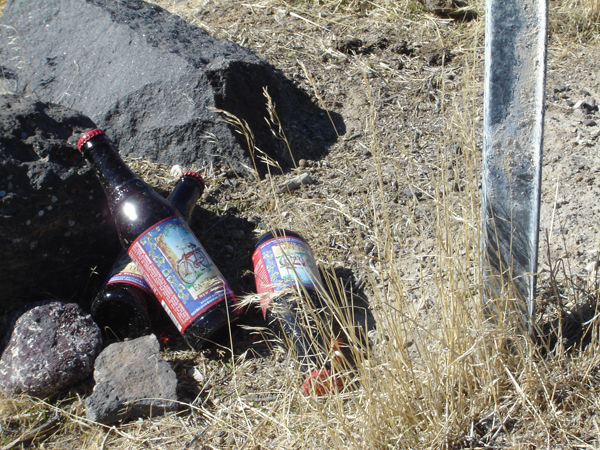 The rangers at the Golden Spike monument tell me that these have to be replaced regularly as they’re often souvenired by visiting aesthetes. The road at this point is rocky and rough. Having high-centred a rental car in 1997, I hired a 4WD with high clearance (a Subaru ‘Outback’, mate). That didn’t get me any closer. You have to walk the last stretch. It’s a better engagement with the site and it means there’s no parked car in any of your documentation photographs (leave that to Le Corbusier). 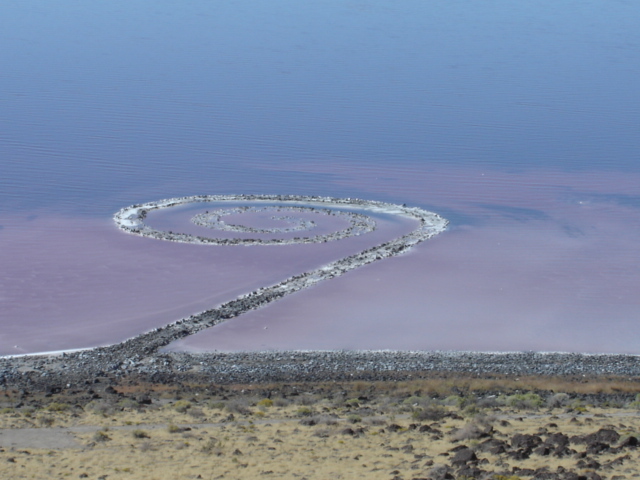 Robert Smithson, ‘Spiral jetty’, 1970. Photograph: Chris McAuliffe. On foot, and at the entrance to the jetty. 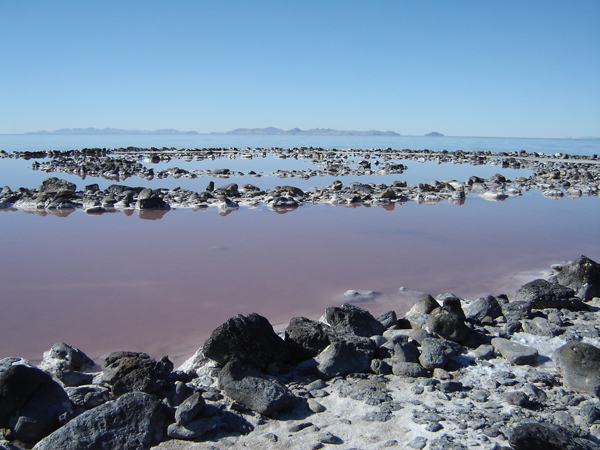 Great Salt Lake literature repeatedly adopts the language of the sublime: eerie silence, vast expanse, disorienting vistas, mirage-like atmospheric effects. All are appropriate; it’s a remarkably still and enveloping landscape, even if the city is barely 90 minutes behind you. Also aromatic; a pungent, composting smell of mud and sludge. And there are rattlesnakes, midges and such. This is early in the morning. I’m the first visitor (and I saw no one else until I passed a car on the road out). 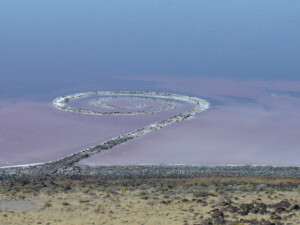 ‘Spiral jetty’, from the primary length, across the spiral centre . Photograph: Chris McAuliffe. A mild winter means reduced snow-melt run off. 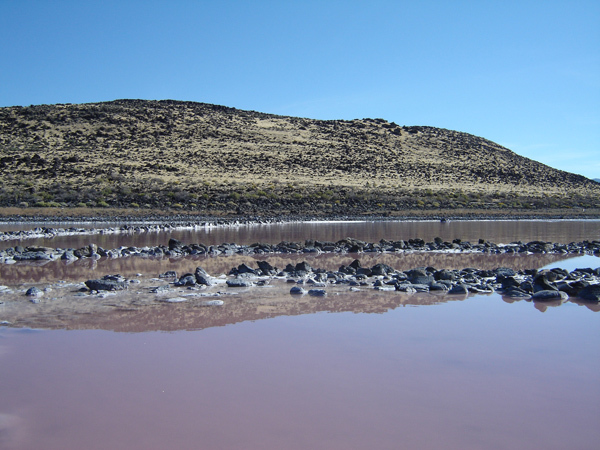 And a hot summer means evaporation and a low water level in a shallow lake. So the jetty was visible and walkable in 2006. The simple construction method of compacted rocks, gravel and soil is visible. Erosion is significant; the wave action on Great Salt Lake is strong as the wind simply pushes the shallow water around the basin. Salt encrustation—the crystalline forms that were a leit motif in Smithson’s work—is very evident. 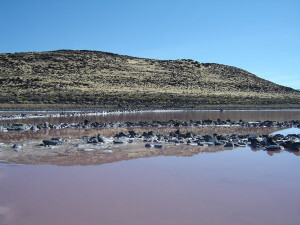 The pink algal colour of the lake also shows up in the photograph. On site, the pink is stronger in the peripheral vision, prompting constant sideways glances in search of an elusive colour. Moving towards the centre of the ‘Spiral jetty’. Photograph: Chris McAuliffe. Walking the length of the ‘Spiral jetty’, Smithson’s road to nowhere becomes vertiginous and nonsensical at the same time. Like the mariner in Poe’s ‘Descent into the maelstrom’, there’s a temptation to reflect clinically as one spirals towards oblivion. But it’s a highly sensual experience too. The silence of the site is especially important in that regard; there’s no incident or drama, just time and passage. The central arcs of the jetty are almost submerged. The surface of the pathway is soft and sludgy underfoot. The trapped water, undisturbed by wave motion, is a deeper pink and the salt crystals are caked more thickly on the rocks. Planning ahead, I’d brought ragged sneakers and jeans which I threw out after the site visits. Submerged edge of the jetty. Photograph: Chris McAuliffe. There’s no escaping the over-determination of the site; everything I’ve read and seen ahead of the visit. So some of my photographs act out the psychedelic rhetoric of Smithson’s texts and film; especially the ideas of reflection, mirroring and setting the controls for the heart of the sun. 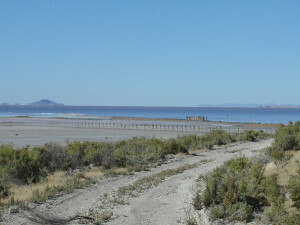 Looking back from the centre of the ‘Spiral jetty’ toward shore. Photograph: Chris McAuliffe. Walking back to shore, the jetty shrinks a little before the weight of the hills. 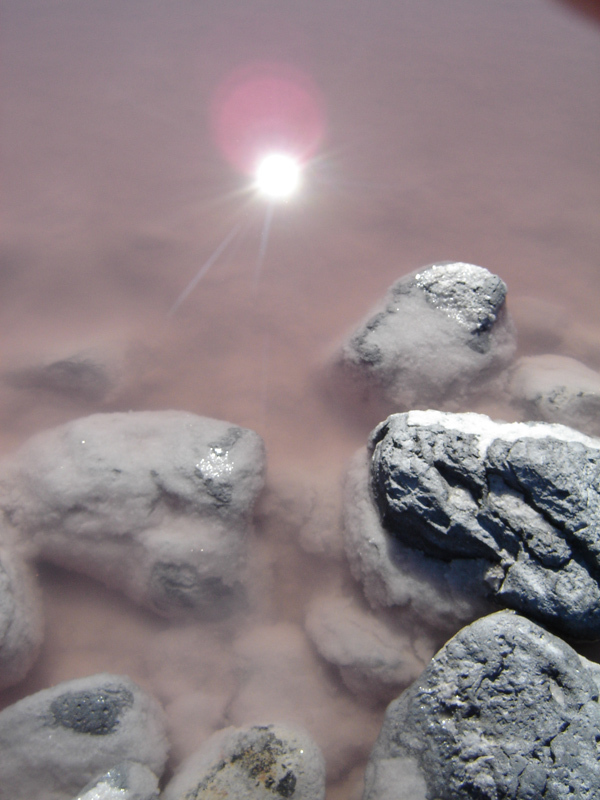 It seems to compress on the surface of the lake and descend in to the water. By now, without realising it, I’ve become quite sunburned by reflected sun, as if I’d been out on a boat. I’d assumed a landscape experience would be a land-bound one. Smithson gave detailed instructions for the photography of the completed jetty, including a sketch requiring an elevated vista. A fifteen-minute walk up the hill delivers something approximating it, although the ‘classic’ shots all seem to be from a helicopter. Litter at Rozel Point. Photograph: Chris McAuliffe. A peculiarity of every earthwork site I’ve visited is that folks are driven to neck a few beers. And it’s always a microbrewery product, never the common-or-garden suds of the American teenager. Says something about the kind of person who makes such pilgrimages. Rozel Point oil drilling site, from the hill above ‘Spiral jetty’. Photograph: Chris McAuliffe. The original jetty at the Rozel Point oil drilling site is ignored in the ‘Spiral jetty’ literature and cropped out of the photographs. I think Smithson wanted a dialogue between the two; after all, he’d declared that he would let the site determine what he would do. His ludic spiral talks back to the pragmatic, linear geometry of the adjacent jetty (on which Gulf Oil spent more than $10,000 in the early 1960s). Seeping asphaltum deposits at Rozel Point. Photograph: Chris McAuliffe. Rozel Point never delivered oil in commercial quantities. 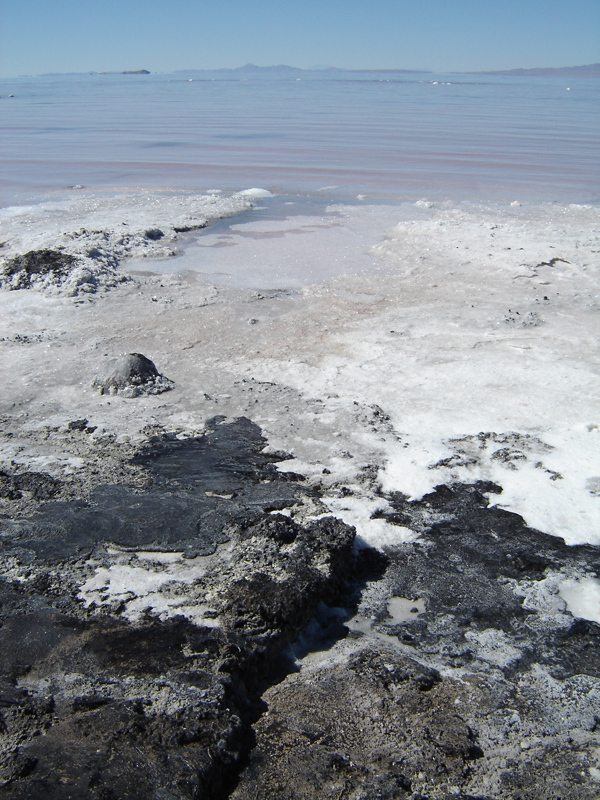 But asphaltum still oozes out of the ground, soft in the hot Utah sun.The air is heavy with a bituminous aroma. A landscape both industrial and primordial and, as a result, eminently Smithsonian. As I turned to walk back to shore, a coyote ran across the muddy flats; I thought of Joseph Beuys (remember him?). But beautifully evoked, and lovely to “relive” vicariously a follow-up visit when the site was so different from that 1997 visit. By way of explanation, the jetty was underwater in 1997. Opaque water and absence of signage made it nigh on impossible to locate. And Rozel Point was far less ‘groomed’, with piles of rusty wreckage. I’ll dig out the 35mm slides, scan and post them.